The Milkman 20W Creamer was designed to find a balance between a perfectly voiced guitar tone with a fair amount of power and portability. In studio, the Creamer is virtually silent when idle. Its the ultimate refinement and alternative to the vintage, small-format amplifier. The Creamer includes an adjustable cathode bias circuit so that the user can easily substitute 6L6 or 6V6 output tubes with no need to rebias the output tubes. There's also a rear-mounted switch to maintain an 8ohm speaker output regardless of which tube type used. Inside of the chassis, you will find an internal bias adjustment in case you want to fine tune the cathode bias when substituting in vintage tubes which tend to draw more current. With 6V6, the Creamer puts out about 20 watts into 8ohms and has sweet breakup. Put a pair of 6L6s in, flip the switch on the rear panel, and you get a bit of more low end, subtler mids and a touch more headroom. The tremolo circuit in the Creamer is unique and sounds outstanding. It is harmonically rich, deep and has a very useful range of speed. Jupiter Large Ceramic 12" is a transparent sounding speaker. Bright, Lively, and very efficient. Its got a great bottom end even at low volume. This speaker will not break up no matter how hard you push the amp. Jupiter Alnico 12" has a classic American alnico magnet sound. A bit less transparent in the upper midrange, this speaker adds a "woody" tone to the Creamer. Its still lively on top, and a bit more focused in the bass response than its ceramic magnet brother. The speaker starts to break up and add alnico character as the amp is pushed. Celestion Alnico Creamback 12" takes the Creamer into a totally new direction. This speaker is very mid-forward with little midrange scoop. The top is smooth and bright, and the bass response is the tightest out of the three options. This speaker starts to break up when the amp is driven hard, adding a unique midrange boost as you push it. 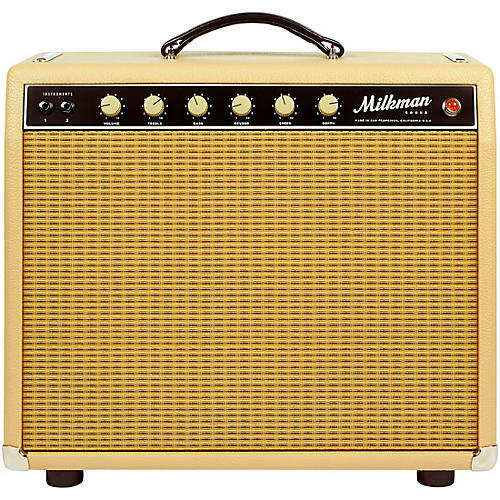 Like all Milkman amplifiers, the Creamer is built using the finest possible components onto a turret board, and is hand-wired with cloth covered wire. Dimensions: 19.8" x 16" x 9.5"